California's Sierra College is investing in makerspaces with a $350,000 grant from the California Community Colleges Chancellor's Office. The college was one of 24 to receive a CCC Maker grant to "create an inclusive makerspace community, provide internships, and develop curriculum to prepare students with innovation and entrepreneurial skills to thrive in the regional economy." The college has partnered with Hacker Lab in Rocklin, Curious Forge in Grass Valley, and Truckee Roundhouse in Truckee in a collaborative effort devoted to sharing best practices, preparing students with STEAM skills and developing a model for college makerspace communities. "We've made a conscious decision to partner with community makerspaces … that are near our campuses and reflect the unique culture, interests and businesses in each part of the region," explained Willy Duncan, Sierra College superintendent/president, in a statement. 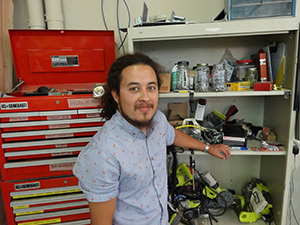 "Engaging community college students and faculty in makerspaces, and growing the maker and entrepreneurial mindset to develop creative, passionate, curious and persistent lifelong learners and educators, is essential to complement existing college programs," said Dominic Felipe Gutierrez, Sierra makerspaces director, who serves as a liaison between the campuses and the makerspaces. "The skills needed by employers are changing so rapidly that Sierra College is boldly embracing this initiative to transform what we teach and how we teach." "In a makerspace community, members teach each other and collaborate on projects," continued Gutierrez. "Students may teach faculty and business owners skills, and they in turn may mentor students. There is a natural comaraderie when people are working in a shared work space and learning creative ways to use laser cutters, 3D printers and electronics, with a variety of materials such as fabric, wood and recyclables to develop new products or complete class projects." More information on the CCC Maker initiative is available here.